Every year when spring arrives I get in the mood to clean out and re-organize drawers and closets. I have several areas on my list this year to tackle but due to an annoying pinched nerve have not been able to move very quickly on this task. Last weekend with some major help from Dave, I was able to finish up the first of these projects. 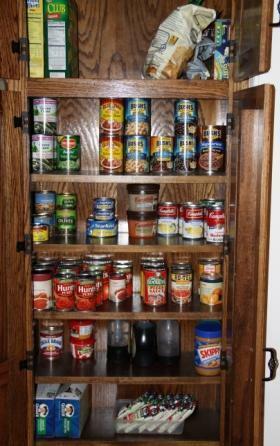 I am lucky to have two separate pantries in my kitchen where we store all of our food supplies with the exception of spices and oils. We call one the “brown” pantry and the other one, the “white” pantry. We are just clever like that! The brown pantry houses our canned goods, cereal boxes, crackers and chips. 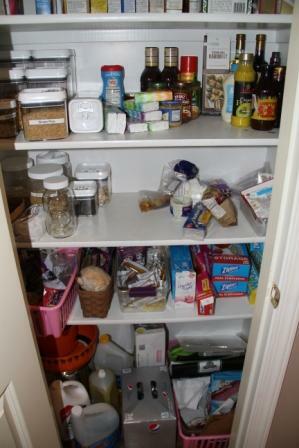 It has fairly narrow shelves so besides minor arranging when I am putting away groceries, it stays fairly organized. The white pantry is another story. This cabinet has very deep shelves and no matter how many arrangements I come up with, tall things in back, like items together, etc, it always ends up being a mess. I have been known to review the contents prior to a trip to the grocery store and come home with purchases that were duplicates to items hiding behind other items on the shelves. I hate that!!! 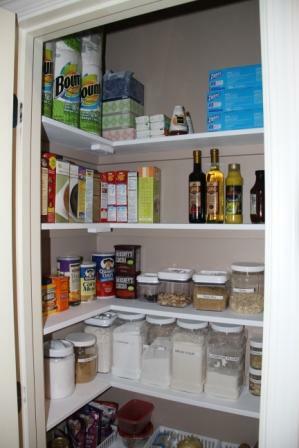 So, for a while I have been looking for ideas to help me get this pantry organized. My first brilliant idea was to transform our laundry room into a walk in pantry and move our washer and dryer up to our master bedroom closet. It makes perfect sense to me to have your washer and dryer where your clothes are, and believe it or not, our closet is actually large enough to accommodate that idea. Dave would not even consider it, citing some lame excuses about plumbing and door openings not being wide enough to get the appliances through. Let’s just say his remodeling sense of adventure is not equal to his motorcycling sense of adventure. I have such a hard time understanding that! I finally settled on reworking the shelves to make them narrow so that most items placed on them are only one item deep. Dave purchased and cut the shelves to fit. We then painted them and also gave the inside of the pantry a new coat of paint. I absolutely love the results. 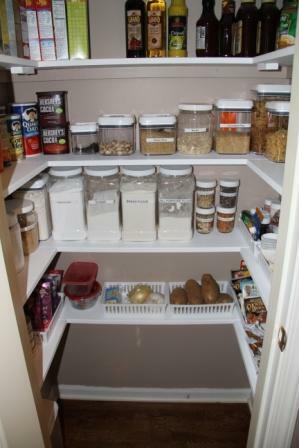 Now I can see everything in the pantry at a glance and everything has it’s own place. Life is good!!! I love what you did with the white cabinet! 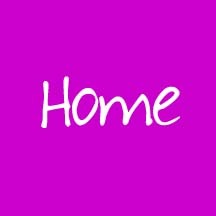 Theresa – you should go in the business of organization!!!! The pantry looks exactly like I knew “your” pantry work look like! Great job… and Kudos to Dave! Theresa, you are the most organized person I will ever know.